Whether your laboratory is replacing damaged or worn-out equipment, or you are looking for an affordable way to start a new semiconductor production line, or add to your existing set-up, you want to know that the used laboratory equipment you’re sourcing is accurate, reliable, consistent and uniform across the entire operation. Bid service offers you quality used and refurbished lab equipment, including used spectrophotometers and a whole host of other products from the best known manufacturers in the industry. 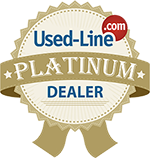 As one of the foremost used lab equipment dealers in the USA, we ensure you purchase only top-quality refurbished, recalibrated and restored equipment for your operation. We endeavour to carry a full and comprehensive range of refurbished laboratory equipment. As refurbishers and distributors of quality second-hand lab equipment, our range can vary from time to time and we recommend browsing our site regularly, or getting in touch to find out if we’re carrying what you need. We also buy pre-owned equipment, so if you have any used lab equipment for sale, equipment you wish to replace, or if you are moving, closing down a section of your operations, or need to sell a full operation, we will assess your second-hand equipment and make you an offer. There is nothing currently listed matching this criteria.